The sixth graders investigated changes in matter at the beginning of the second quarter. They dissolved sugar cubes in ice water, tepid water, and hot water to see how increased temperature affects the rate at which substances dissolve. After that the children explored solvents and solutes by trying to mix food coloring, water, and oil. Data loggers were used to investigate temperature changes in a reaction of baking soda and vinegar. The pH of acids and bases was explored with the use of cabbage juice indicators. Later, the children painted cabbage juice soaked “chem-eleons” with different solutions to make colorful creations that demonstrated acid and base reactions. In December and January, the class studied objects in motion. The children learned that gravity pulls objects at an equal rate by doing an experiment in which they timed the drop of two steel balls of significantly different masses. The balls landed at the same time! After that they made two origami boats with different shaped sails to test the effect of sail shape on boat speed. 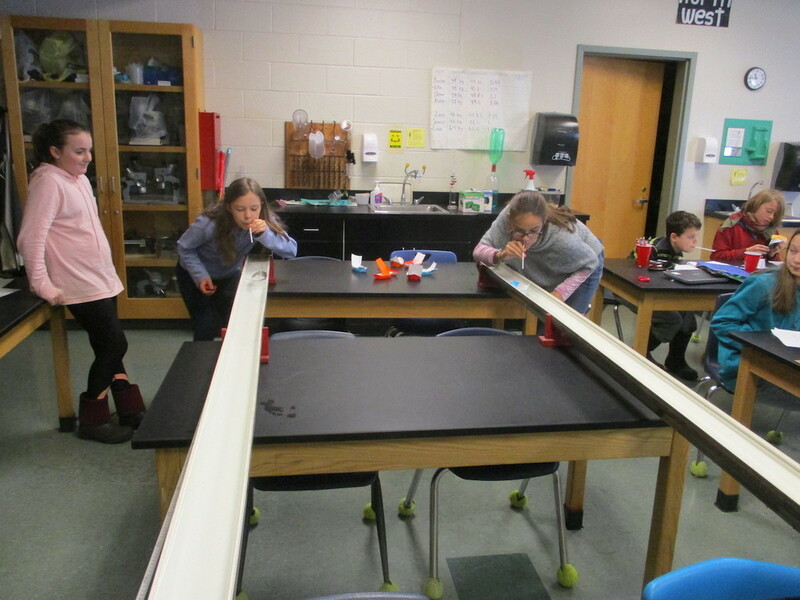 Friction and inertia were investigated by measuring the distance a balloon-powered box on a table would travel compared to a balloon-powered box on rollers. Recently, the kids built and “drove” balloon-powered cars to explore the law of action and reaction. The children also participated in a Four Winds class that introduced the study of rocks, minerals, weathering, and erosion. Finally, the children went out to the Grant Brook Weather, Woods, and Water sight twice. During the first visit the children carefully insulated and hid grapes. A few weeks following the first trip they recovered their grapes to see if they survived. It was a rough two weeks for the grapes. Only four of the 24 grapes made it!